Mark Johnston is the author of 11 books and is the Head of History at Scotch College in Melbourne, where he has taught since 1991. In 2014 and 2015 he was also an Adjunct Senior Lecturer at the Australian National University's Strategic and Defence Studies Centre. 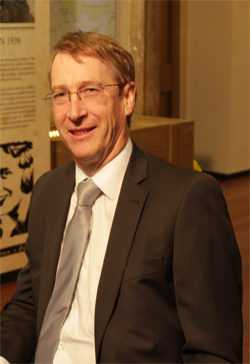 He is most interested in the experience of ordinary Australians at war, and has established a reputation as one of the leading experts on Australian involvement in World War II. The Unwomanly Face of War, an extraordinary book about Soviet women in WWII, by Svetlana Alexievich. I love many libraries, including the State Library of Victoria, the Mitchell Library and the library of the Australian War Memorial in Canberra. What’s the best piece of advice you have given or received? Proofread and edit everything you write. The American TV series and book, A Band of Brothers, and the desire to pay tribute to three veterans who helped me when I first started writing about Australian soldiers, in the late 1980s. 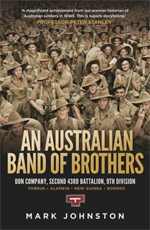 Want to read more about An Australian Band of Brothers? No ordinary soldiers, they were members of Don Company of the Second 43rd Battalion, part of the famous 9th Australian Division, which - during campaigns in Tobruk, El Alamein, New Guinea, and Borneo - sustained more casualties and won more medals than any other Australian division. It is an evocative and detailed account of the day-to-day war of three infantry soldiers whose experiences included night patrols at Tobruk, advancing steadily through German barrages at Alamein, charging enemy machine guns in New Guinea, and repelling Japanese charges on Borneo.